Start drawing with the included pencil, and the black coating disappears to reveal gleaming, tie-dye colours beneath. A light-hearted, super-trippy, stoner-themed gift. 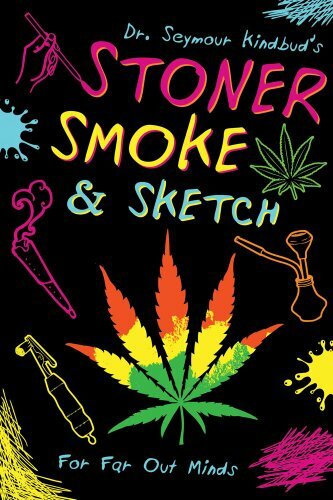 This book will appeal to hipsters, the growing medical marijuana community, and tokers who didn t grow up with this cool scratch and sketch concept. Peter Pauper Press has sold millions of this format to children, as we will to stoners. Unleash your inner child and take a scratch at this fun activity! Dr. Seymour Kindbud, green grower extraordinaire, dabbles in the arts and crafts world to bring you this spectacular book. Let these blank pages unfold into colors trippier than tie-dye with Dr. Kindbud leading the way. Did you ever color a rainbow-hued drawing and then color over the whole thing with black crayon and then draw over the black to uncover the background? That s the general concept here, except that it s much cooler, much simpler, and with an element of surprise. Dr. Seymour Kindbud has published a variety of cannabis-related titles, using clear, colourful, and comprehensible knowledge of the green world. As an acclaimed and knowledgeable author for Cider Mill Press, his subject is both entertaining and pertaining to our modern culture. Dr. Seymour Kindbud has published a variety of cannabis-related titles, using clear, colorful, and comprehensible knowledge of the green world. As an acclaimed and knowledgeable author for Cider Mill Press, his subject is both entertaining and pertaining to our modern culture.